Investors have known it’s been coming all year. At nearly every FOMC meeting this year, there existed the imminent possibility of the Federal Reserve hiking the federal funds rate. Well, it’s finally here, but what does it mean for the peer-to-peer lending industry — and more specifically for investment portfolios with a p2p allocation? With consideration of factors such as statements made by industry leaders, macroeconomic data, and our experienced team’s input, we have carefully established our thoughts on this topic. Briefly examining broader implications, higher interest rates will decrease the yield to maturity of fixed-income investments. For liquid securities that are bought and sold on the open market, the implication is that the principal value would be discounted to reflect higher market interest rates. However, p2p loans are not yet as liquid as bonds, so our analysis will primarily consider potential changes to investor cash flow and reinvestment. In this post, we will consider two key areas of impact for p2p investors. First, how a higher federal funds rate may impact borrower defaults and ultimately investor returns. Second, how rate increases will impact the borrower demand for consumer loans — potentially impacting marketplaces’ rate of growth and overall success as we enter a rising rate environment. For our analysis, we utilized FRED (Federal Reserve Economic Data) seasonally adjusted data to compare the federal funds rate to the consumer loan delinquency rate at the end of each quarter from 1987 (the first available date of consumer credit delinquency rates from FRED) to present. The goal here to see if any correlation exists between rising rates and consumer delinquency. 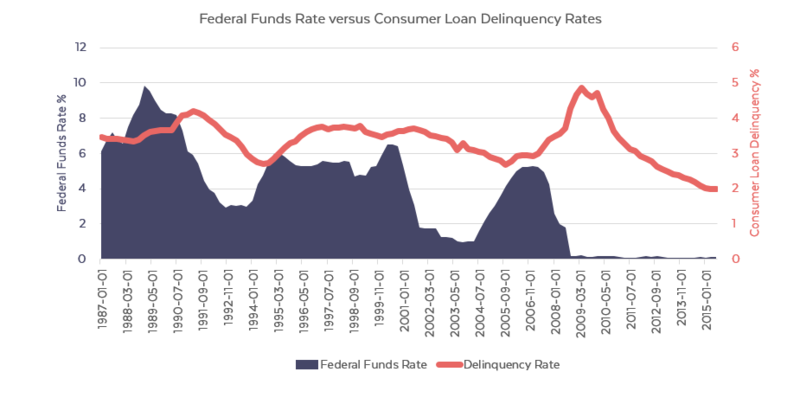 While we see that there is a positive correlation between the federal funds rate and the consumer credit delinquency rate, there is approximately a two year or more lag between changes in the federal funds rate impacting delinquency rates. In addition, since the US economy is currently seeing an inflation rate well below the target of 2%, we don’t anticipate a drastic rise in the federal funds rate – as rate hikes will actually decrease inflation. The fed’s current plan is for rates to be at about 1.38% by the end of 2016. 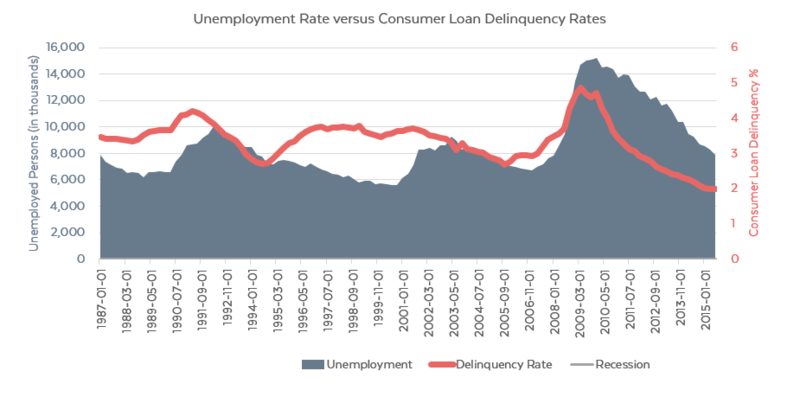 As you’ll notice, the relationship between the relative data points in the graph above correspond much more closely to indicate that the unemployment rate is a much stronger immediate indicator of where delinquency rates are headed in the near term. As the economy is still very much in a period of expansion, we expect unemployment rates to remain low for some time. Renaud Laplanche, CEO of Lending Club stated, “we don’t think we’re rate sensitive at all.” In the short-term, peer-to-peer loans likely won’t see an immediate rate increase, but over time rates will increase to reflect other lending products, such as credit cards and other forms of unsecured consumer debt. To address the second issue of possible lowered consumer loan demand, we used the total consumer credit owned and securitized, outstanding in billions of dollars and converted it to an inflation-adjusted relative number. 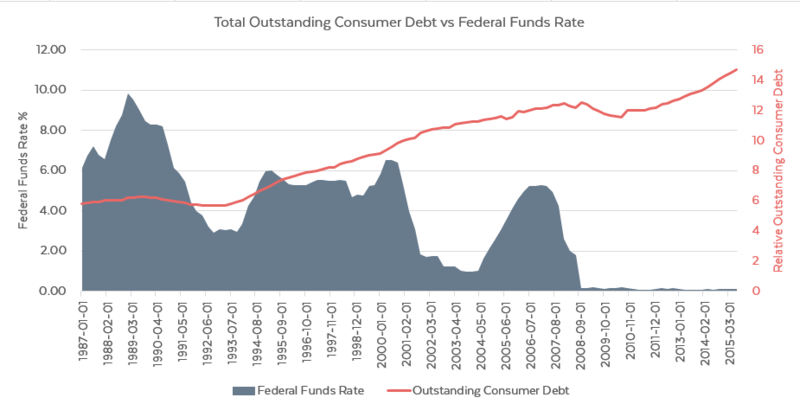 Overall, the trend indicates that consumer debt has increased in the last 28 years almost irrespective of the federal funds rate. Thus, we are not concerned about any significant reduction in the demand for peer to peer loans. We believe a minor rise in interest rates will not impact p2p loans in the short term. Over time, as rates rise, marketplace lenders will gradually adjust their interest rates to remain competitive for both borrowers and investors. We hope our analysis helps to explain some of the upcoming considerations for peer to peer loans relative to the economy as a whole. This analysis was performed for illustration purposes only and does not represent or imply investment advice of any kind.